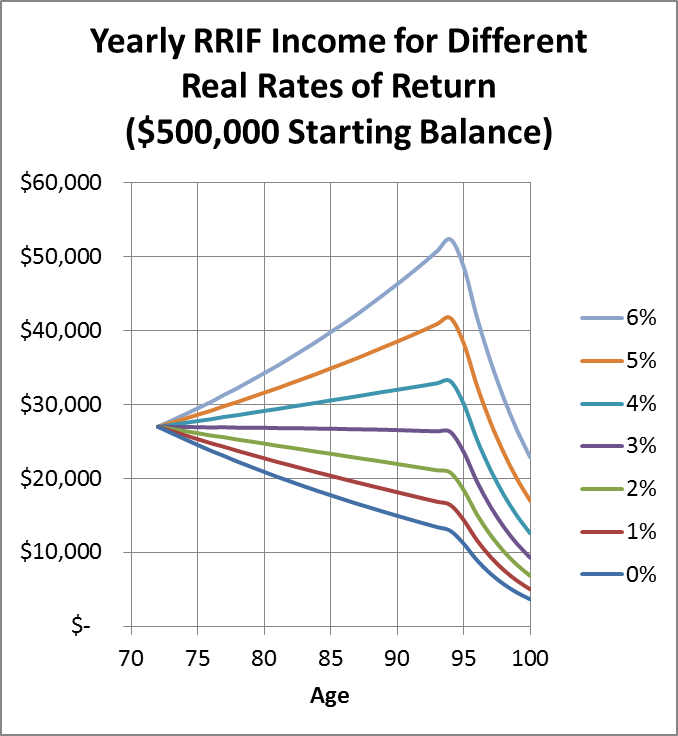 Some time ago I showed that the magic RRIF minimum withdrawal percentages for each age were designed to give the same income each year if your RRIF earned a 6% return. The latest federal budget proposes to change these percentages to make minimum RRIF withdrawals smaller. So, I decided to repeat my previous analysis. You can find the new percentages in Table A5.2 of the budget document. For a starting RRIF balance of $500,000, the following chart shows the yearly minimum withdrawals for 7 different cases of constant portfolio returns ranging from 0% to 6% per year. As we can see, the RRIF income remains closest to constant for a little over 20 years when the investment return is 3% per year. So, the change is essentially dropping return expectations from 6% to 3%. Another more subtle change was to delay by about one year the age where RRIF income starts dropping off. Note that you can think of these return percentages in either nominal or real terms. This means you can think of the return as either 3% or inflation plus 3%. For the case where you want your RRIF income to stay level in dollar terms, you need to earn 3%. If you want your RRIF income to have constant purchasing power, you need to earn inflation plus 3%. Overall, I think this is a sensible change. 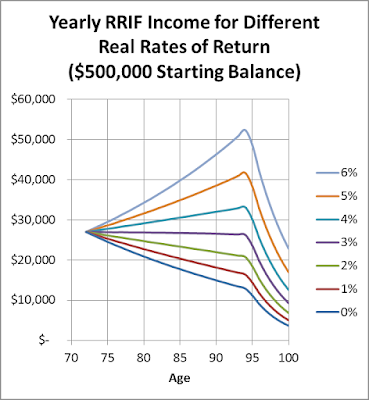 The old minimum RRIF withdrawals caused retirees to spend too much of their income. Savvy retirees just saved part of their RRIF withdrawals for the future, but too many just spent their withdrawals not understanding that they were overspending. "The old minimum RRIF withdrawals caused retirees to spend too much of their income" - Not entirely true. Withdrawal is not spending. If they took excess RRIF withdrawal amount and invested in a TFSA, then it's just about a wash. (assuming a low tax rate in retirement). But, that being said, I do think it's a good idea to let seniors have a lower withdrawal rate if they so choose.